Trailhead A. From the traffic circle in Lom, continue 14 kilometer along Hwy. 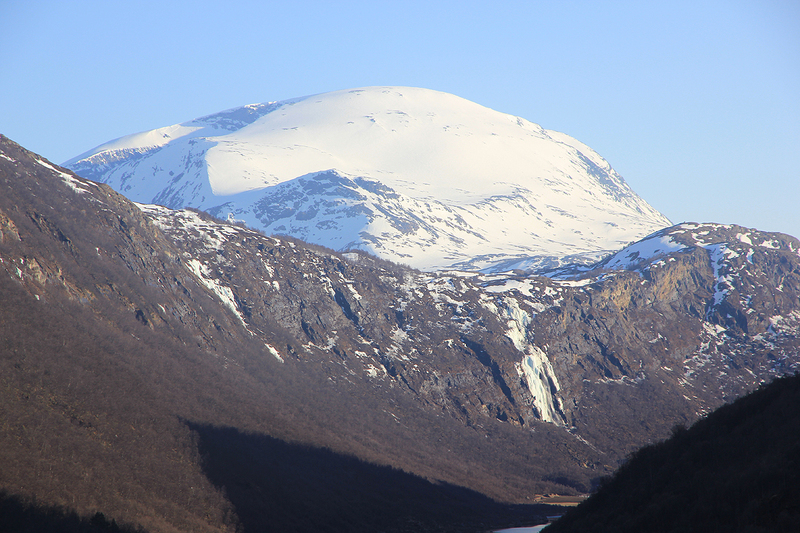 15 (direction Stryn). Locate a sign pointing left saying Lundagrendi and measure from here. After 2.1 kilometer, make a left onto a dirt road with a sign reading Lundadalen. At kilometer 3.0, stop and pay toll (NOK 20 in 2008) at a self serve station. At kilometer 8.8, you arrive at the Lundadalssetra trailhead. Find parking off the road, this is the trailhead, location N61:49.865, E008:13.409, elevation about 773 meter. Trailhead B. The most popular trailhead for this mountain is the mountain farm area called Neto. From Lom, drive Hwy. 55 21.8 kilometer up Bøverdalen (towards Sognefjellet). Turn onto Hwy. 471 (right turn) at Leira Bru and continue towards the mountain farm area called Netosætre. You will first arrive at a sign informing that the continued road is a toll road. Contine less than one kilometer from the toll entrance, then turn right (second right turn) and drive uphill to the highest point on this local road. The road may be closed further down depending on the time of year as well as the local conditions. Route A. The route from trailhead A, will not be further described here. It is likely to work well in winter as well as in summer. However, it is a somewhat long approach. See the route B below. Route B. 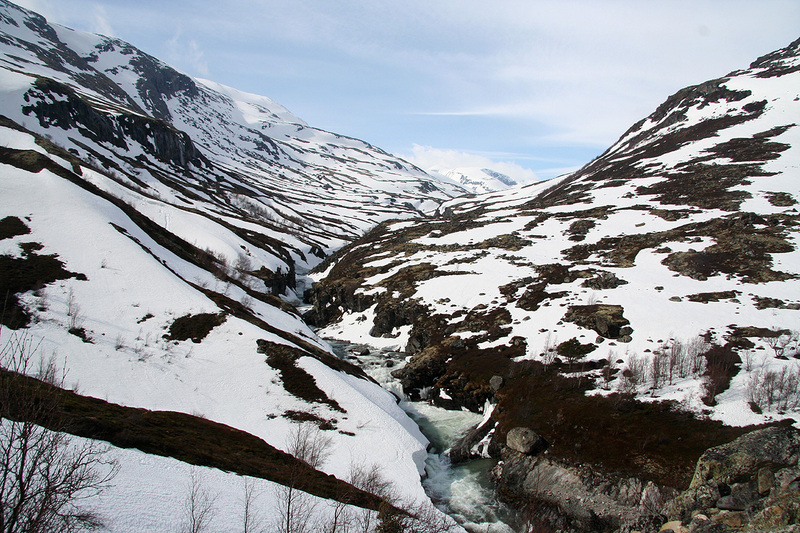 From Netosætre, hike uphill (or ski if there is snow), staying right (east) of the river Geitåe. Gradually, turn more left (north-west) towards the upper part of the river at elevation about 1480 meter. 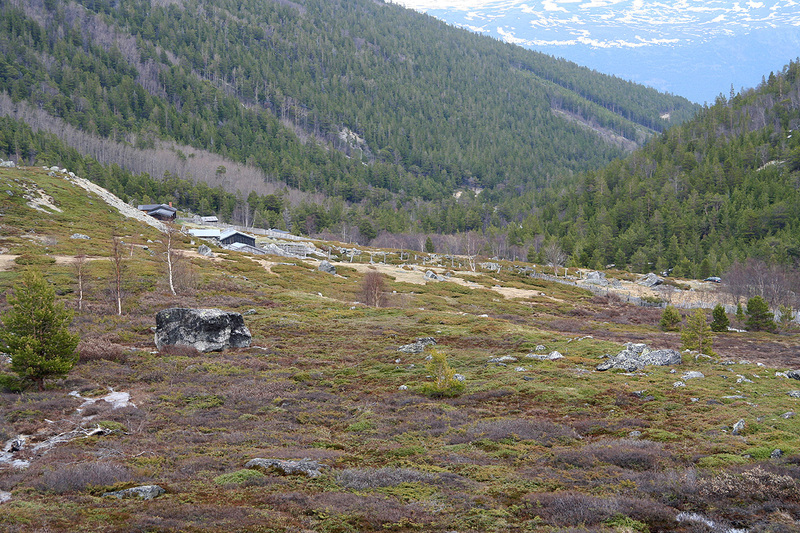 this area is called Geitåholet. 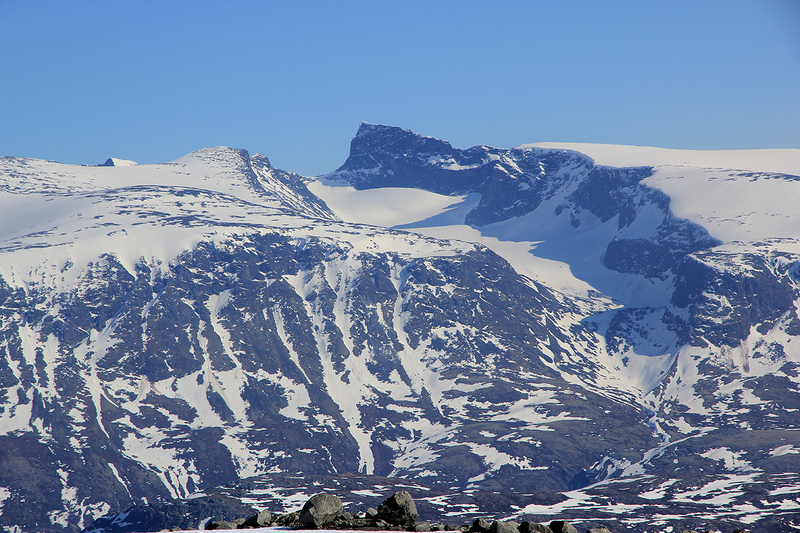 The glacier Heksetebrean is located just a bit higher. Continue uphill to the lower left end of the glacier and ascend easy slopes along the ridge that forms the left (west) side of the glacier. As you reach about 1840 meter of elevation, you will reach a somewhat flat section of the ridge while the ridge subsequently rises a bit more steeply further uphill. The best route now turns left and climbs the slope on the left side of the ridge above you. The slope here is slightly steeper, but perfectly ok to ski. Get back towards the crest of the ridge around elevation 1920 meter. From here, the best route runs directly uphill and crosses a local top at approximately 1985 meter. 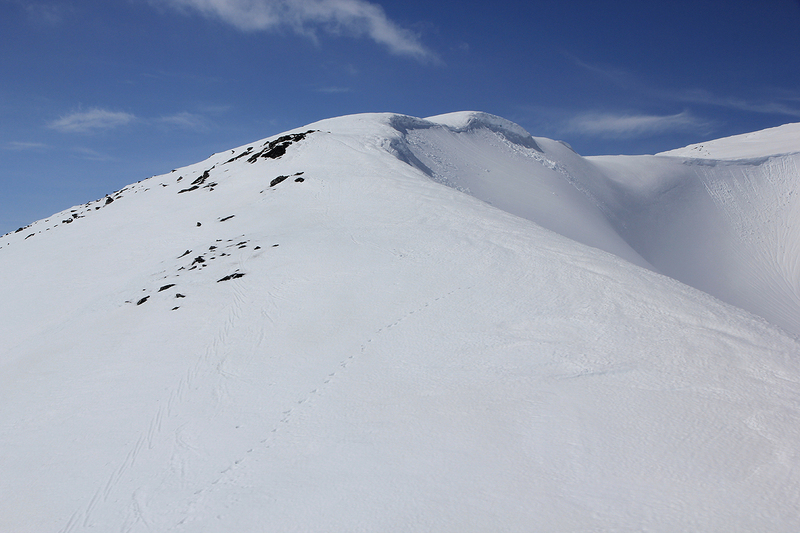 Depending on the conditions, it may be easiest to carry your skis a short section across this little summit. A very nice, easy to ski ridge, continues uphill and connects with the general mountain slope at approximately elevation 2040 meter. 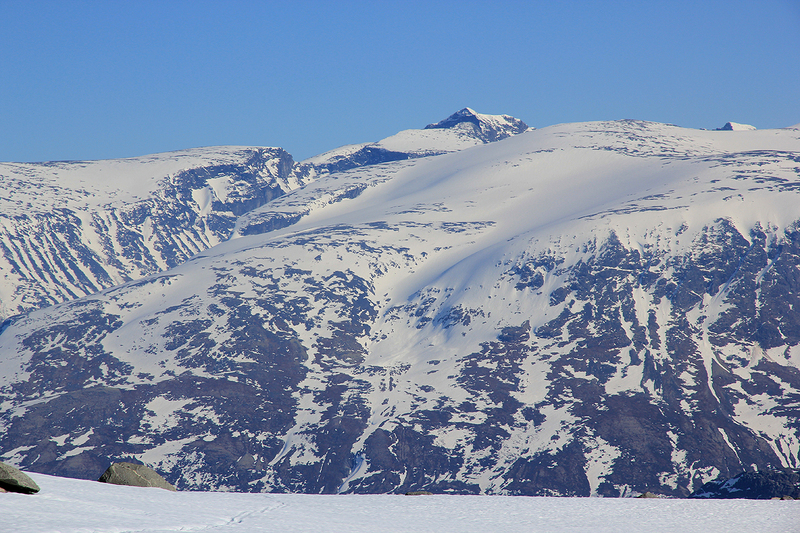 The only nice and safe ski route to Nordre Hestbrepiggen now runs further uphill (north) and crosses the very shallow pass between point 2132 (west,left) and point 2105 (heksete, right, east). Continue north as you descend across a gentle slope, descending on Heimste Brean as you gradually turn left (west) down to elevation about 1950 meter. Ski across the flat glacier and find a good line to ascend more steeply (best with a traverse going right) to reach easier terrain at about 2030 meter of elevation more or less directly south of the summit. 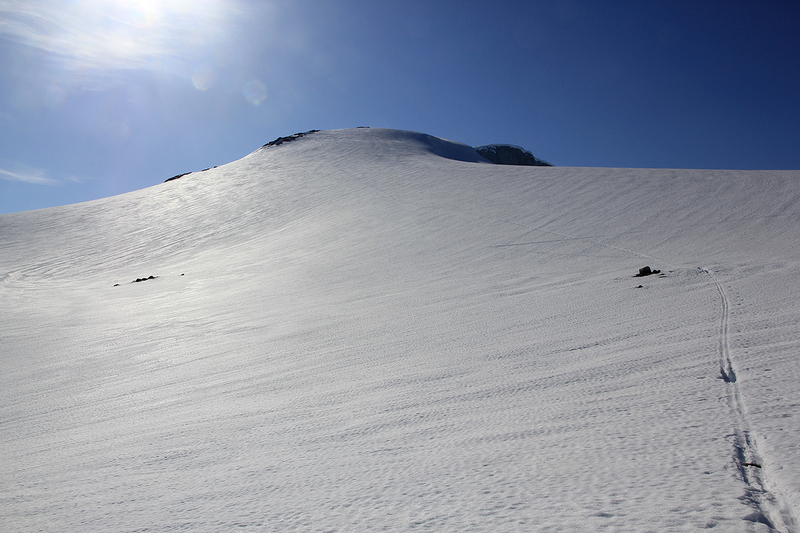 Depending on the snow cover, one may continue on skis all the way up to the summit, or in case of too many rocks, leave the skies as high as practical and complete the easy climb on foot. 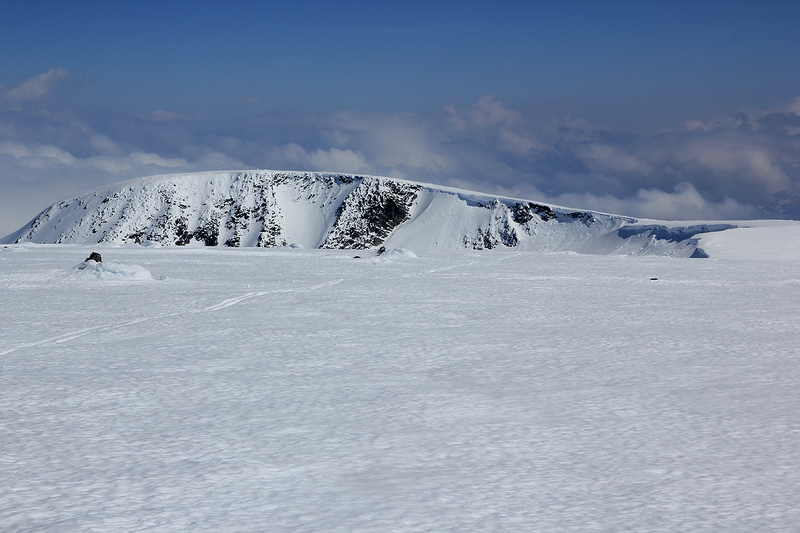 Note that the route described here is by far the easiest access on skis. If one first ski across to Midtre Hestbrepiggen (as we did), then access is more difficult with possible avalanche danger. 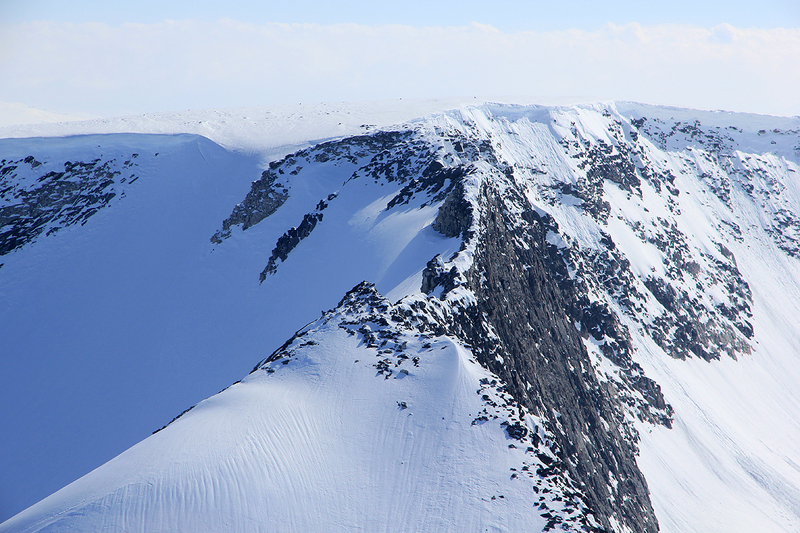 One may traverse the sharp ridge connecting north from Midtre Hestbrepiggen, however this is not a ski route. Failed attempt, May 11. 2008 After an incredibly nice day yesterday, it rained during the night and the day started with overcast weather. I checked out at Elveseter and drove to the trailhead. The weather seemed to improve slightly. It was clear that the first part of this trip would mean hiking with the skis on the backpack. The question was how far and if I would find a reasonably well defined transition between hiking and skiing. The river was huge. The DNT trail pointed across a bridge. Since my mountain was also on the left side of this river, I crossed and started to hike along the trail. The time was 0915 and blue patches started to appear on the sky. The terrain quickly became very cumbersome. Deep patches of snow that did not support walking, a somewhat sloping terrain, dense birch forest and open creeks running across my path from left to right. 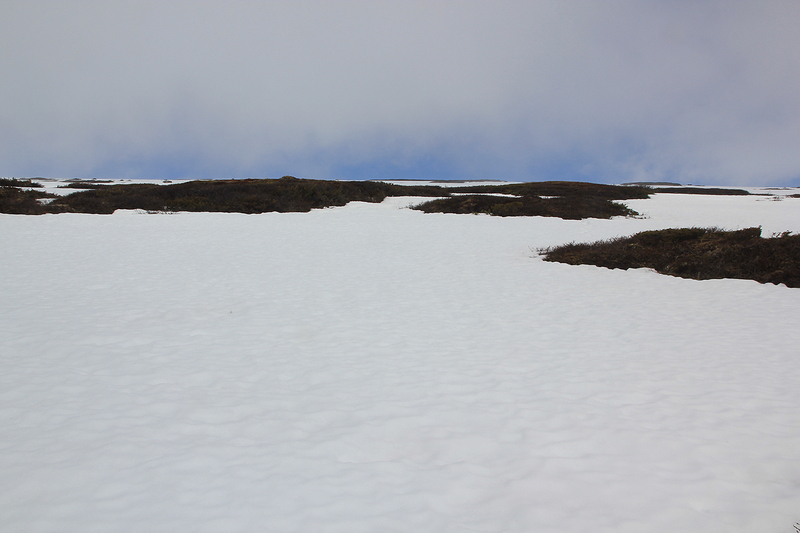 I skied a few patches, but there was enough land without snow to make this rather inconvenient. After about one hour, I came to a new bridge across the huge river. It looked as if I should at least have hiked on the opposite side and crossed here. Where there any more bridges upstream? The map did not show any and this river would be impossible to cross. Thus, I needed to continue on the left side of the river. The good news was that the birch forest gradually gave way for more open country. 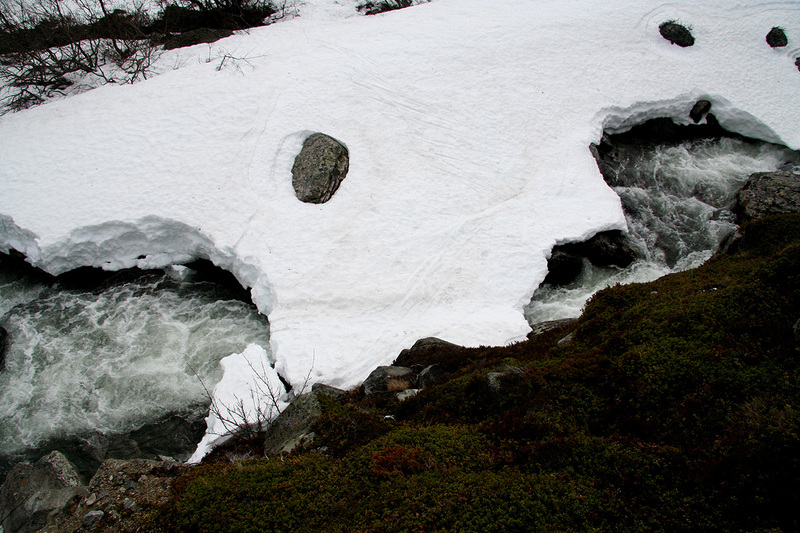 The bad news was sloping terrain with a large number of perpendicular gullies (many with smaller creeks) and a continued alternation between dry land and patches of snow. By 1045, I had reached a nice viewpoint near a distinct right turn of the entire valley. From here, I had a good view further, including a view of what I believe must be the target, Nordre Hestbrepiggen at 2172 meter. I decided to call this attempt off. To succeed woul be an extraordinary big effort and a very long day indeed. A few weeks earlier and skiing would still have been good, a month later and this trip can be done without skis. I had a heavy day behind me yesterday, this was not what I needed today. I came to the conclusion to dedicate the rest of the day to admire and study how spring, in all aspects did arrive in the mountain. Consider the creeks and the birch, consider the melting snow and the roaring river. 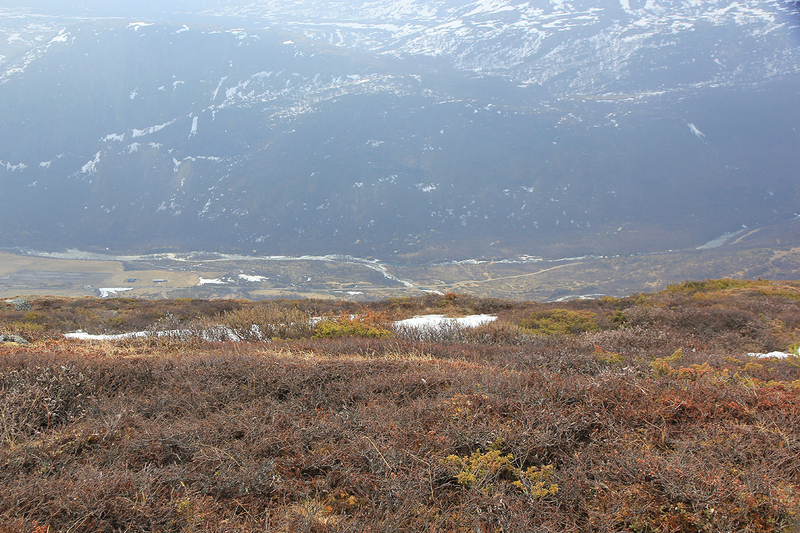 Look at the ptarmigans that are in transition from winter to summer color. 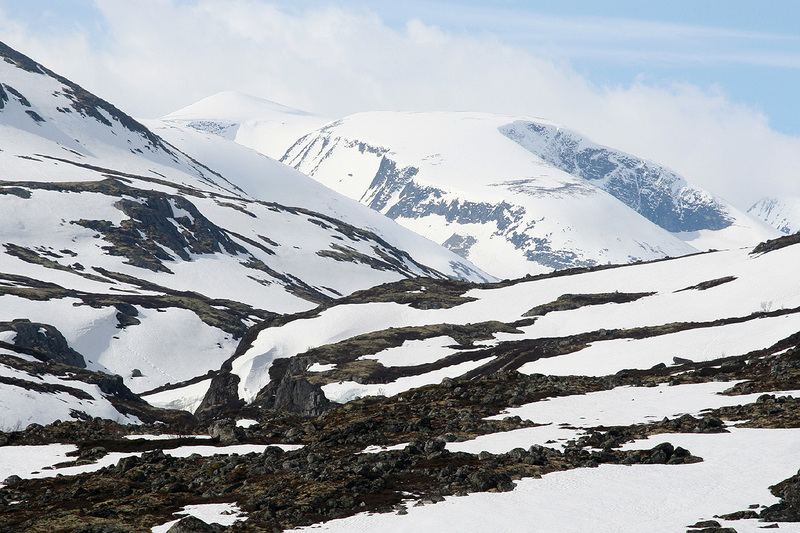 Watch all the small plants that have woken up and started to grow, another 4-5 months and white snow will again spread its white blanket on the mountain. There is a sense of urgency everywhere. I found some soft spot, put on my jacket and fell asleep for about one hour. I had a couple of good dreams, my father, how he often loved to take a brief nap out in the mountains like this. He taught me about the wonders of nature, showed me how to appreciate the greatness of nature. How the mountains are incredibly beautiful and full of life, how they are eternal and unforgiving. One shall visit the mountains, but always keep in mind that you are a guest, that you are there on the terms of nature, sometimes soft, sometimes very harsh terms. I woke up, the only human in this great valley, time to return. I slowly hiked back down to the bridge. I was right, the hiking back to the trailhead was enormously easier along this side. The only trouble was a rather big river that had to be crossed. There were only two snow bridges left. The first one looked highly insecure, to fall through would have been a disaster. I searched more and found the second one. It looked better. With great caution, I skied across it, then climbed to safety in the steep hillside on the opposite side. The rest of the hike back to the trailhead was very pleasant indeed. Returning to the valley, I first explored the planned trailhead for Kvitingskjølen, then decided to finish off the day by climbing Lomskollen. Successful climb, May 18. 2013 We (my son Pål Jørgen and I) drove from Bergen around 1500 on the 17th. 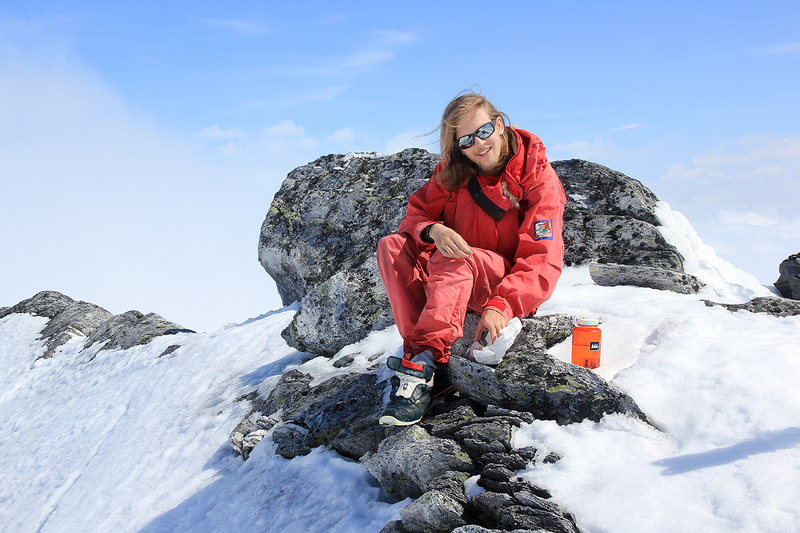 of May and slept at the nice Sognefjellshytta. The next morning, we continued to the trailhead. The road was closed at the toll crossing, consequently we started a bit lower at elevation about 720 meter. (The car may be seen in this picture, near the road to the left of the two trees.) 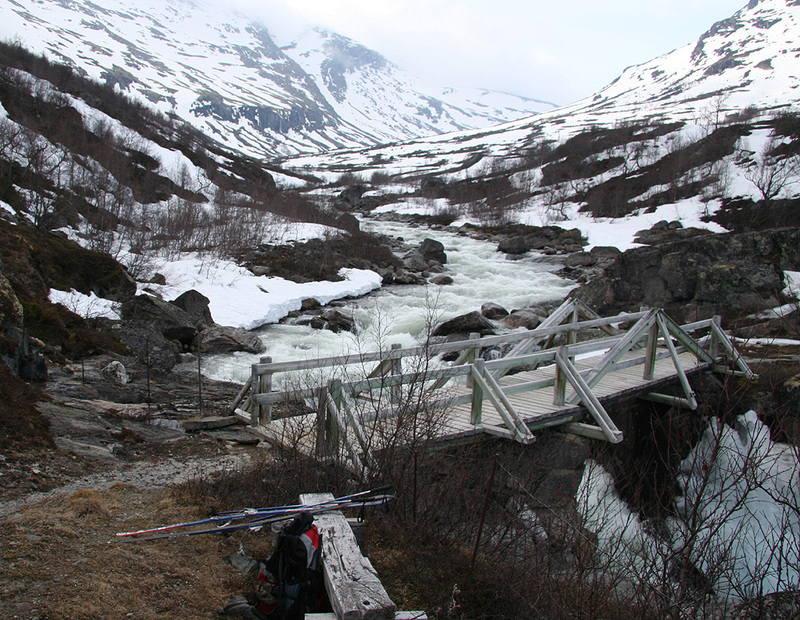 It was immediately clear that we would have to carry our skis quite a way, since there was no snow to be seen on the slope above Netosætre. We started out around 0920 and carried uphill until a bit above 1200 meter. From here, we could ski, the snow was quite wet and did only support us in a partial way. Breaking through into this very wet and soft snow, always means hard work. Unfortunately, we ran into clouds (ie. fog) near the Heksete glacier and thus did not pick the best route at the upper part of the ridge. 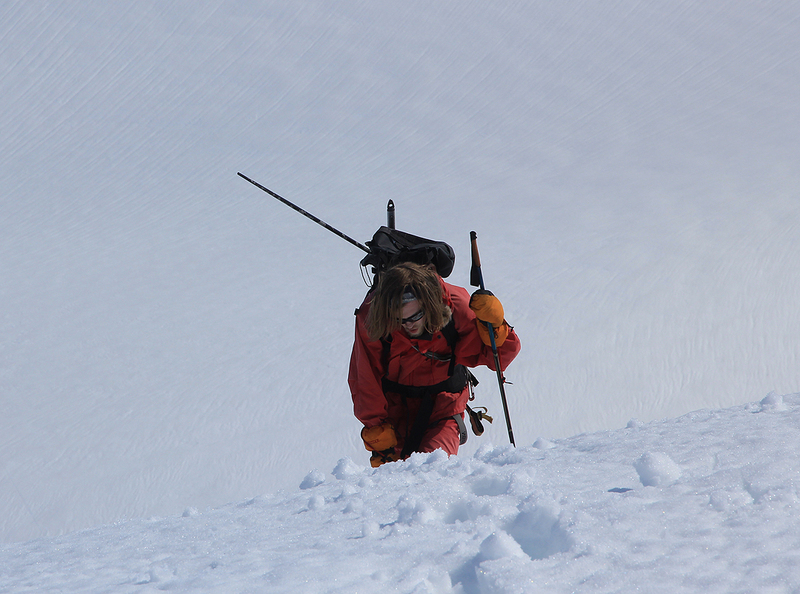 We skied a bit steeper than necessary, then carried across the small ridge summit. This was a good place for a short break. We continued up the final part of the ridge, now in sunshine, then traversed west to the 2070 meter col just east of Midtre Hestbrepiggen (2160m). 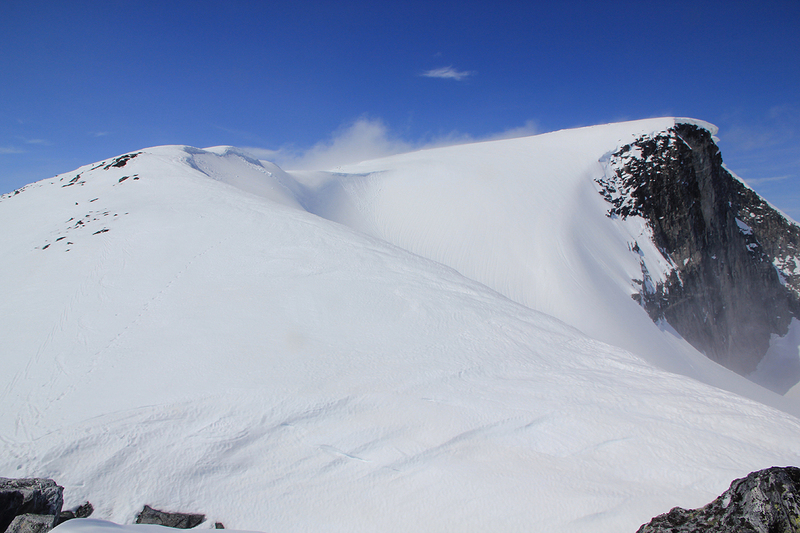 Looking for a safe ski route north and down to the glacier Heimaste Hestbreen, turned out to be nontrivial. 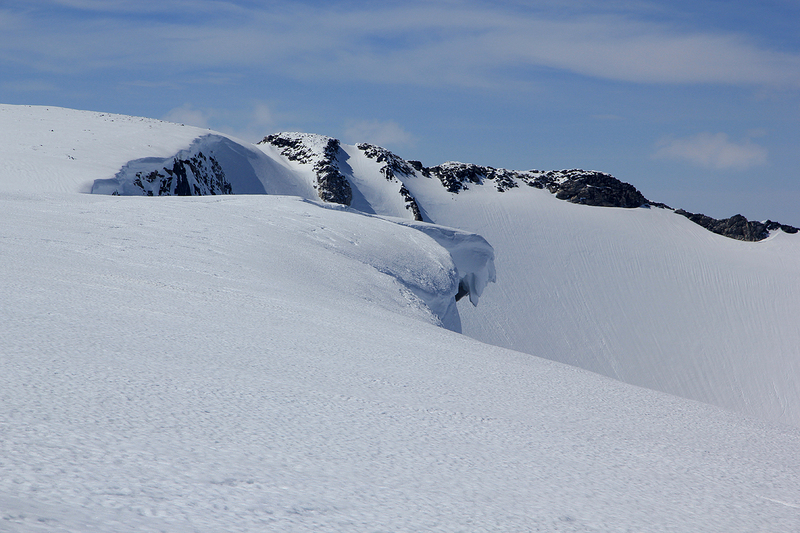 There was a substantial cornice running continuously along the edge on our right. 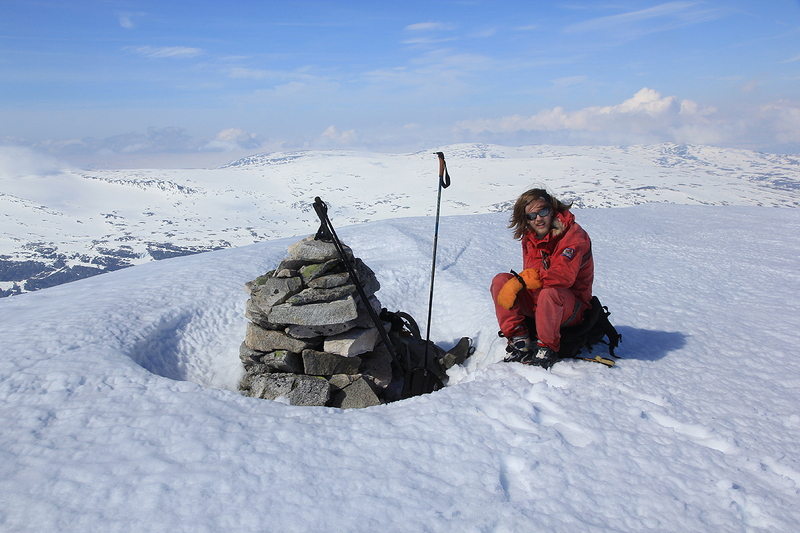 Finally, we decided to visit the 2160 meter Midtre Hestbrepiggen, since, after all, this is also among the 2000 meter peaks in Norway having more than 100 meter of prominence. The ridge connecting north did not look attractive to take on with our somewhat slippery ski boots. An alternative to descend steeply east from the small local col just before the ridge, did not look much appealing either. In conclusion, we realized that the only nice ski route runs north from Heksete and east of point 2132. 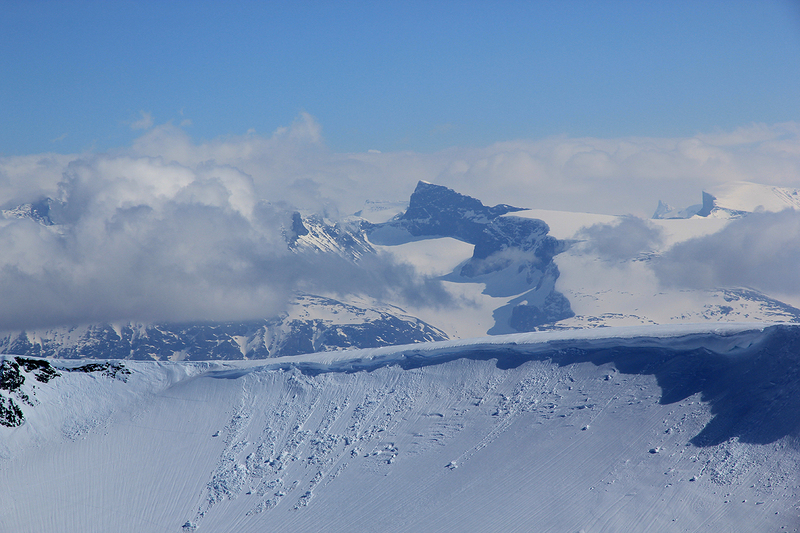 However, upon a closer look, we spotted what looked like a route descending to the glacier from the corner/bend of the ridge just south of point 2132m. Thus, we skied back to this point and found a pretty safe route down that could be skied without difficulties. Avalanches with big blocks from collapsing cornices could be seen both left and right. We skied across the glacier and climbed to roughly 2100 meter. The final stretch was very rocky and easier negotiated on foot. 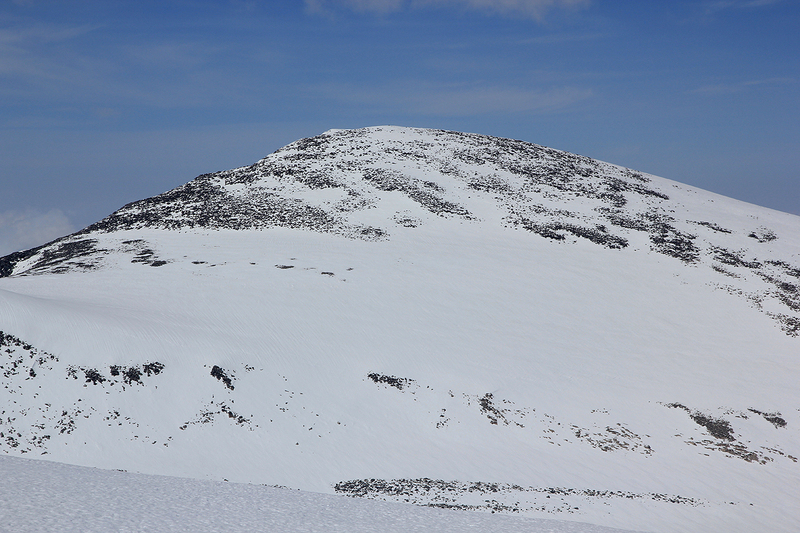 We reached the summit around 1620, pretty late, but the conditions had been far from easy. 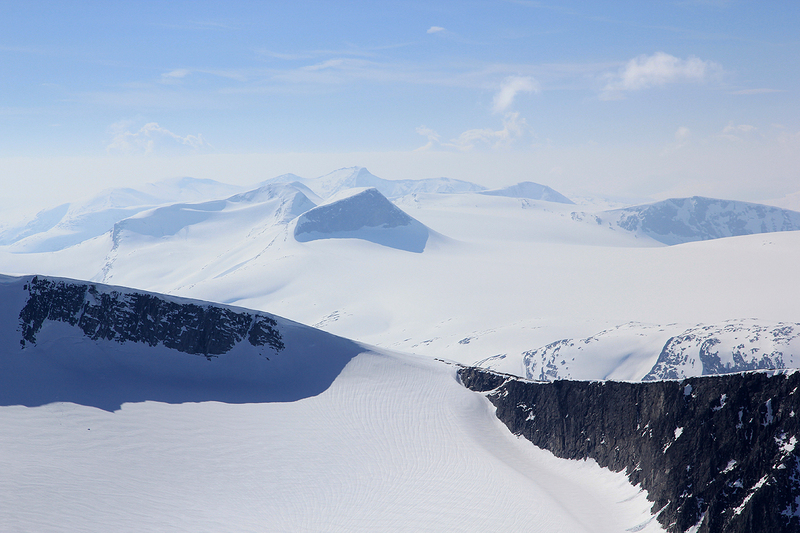 After about 10 minutes we returned, but this time via easy skiing north of point 2132 meter. The skiing turned into incredible break-through falls and we had quite a struggle to make it back down to the 1200 meter snow line. We finally made it back to our car by 2020, pretty hungry. The decision was easy, the only place that likely could serve us a good dinner would be Fossheim hotel in Lom. Hestbrepiggen, a goal beyond reach this day. The upper part, of the mountain. 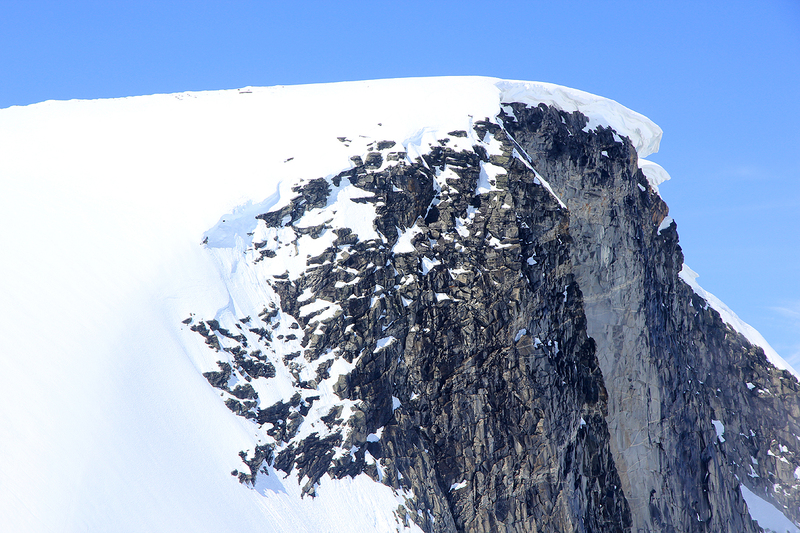 The narrow ridge, connecting south to Midtre Hestbrepiggen. 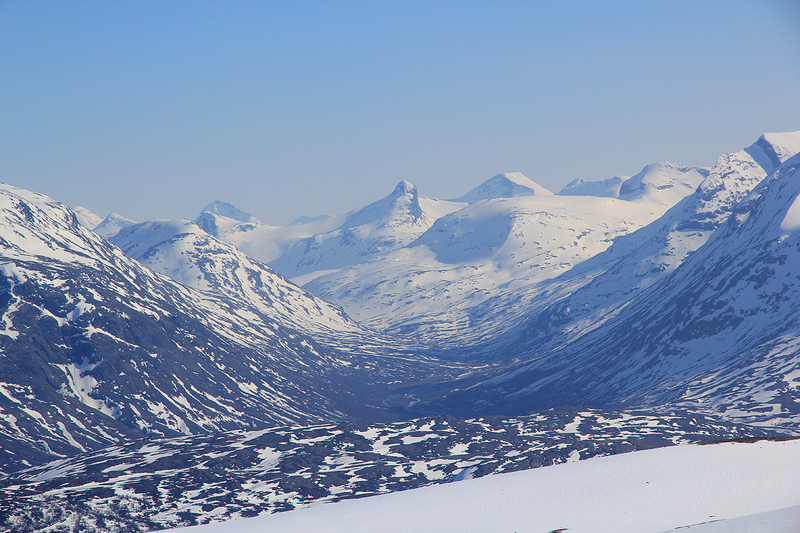 View towards central Jotunheimen, our route down is just left of the avalanche (snow) debris. 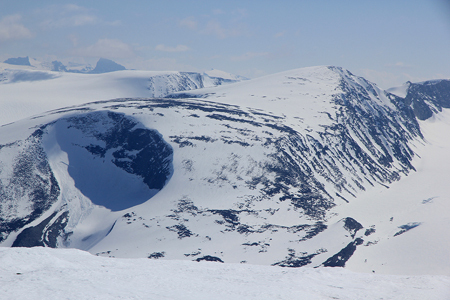 Summit view south, across to Midtre Hestbrepiggen. 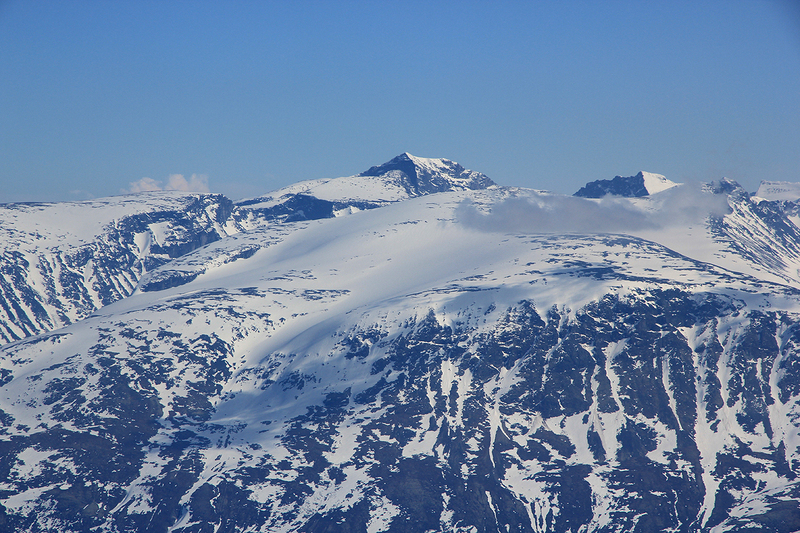 Jotunheimen view, southwest while descending towards Neto. 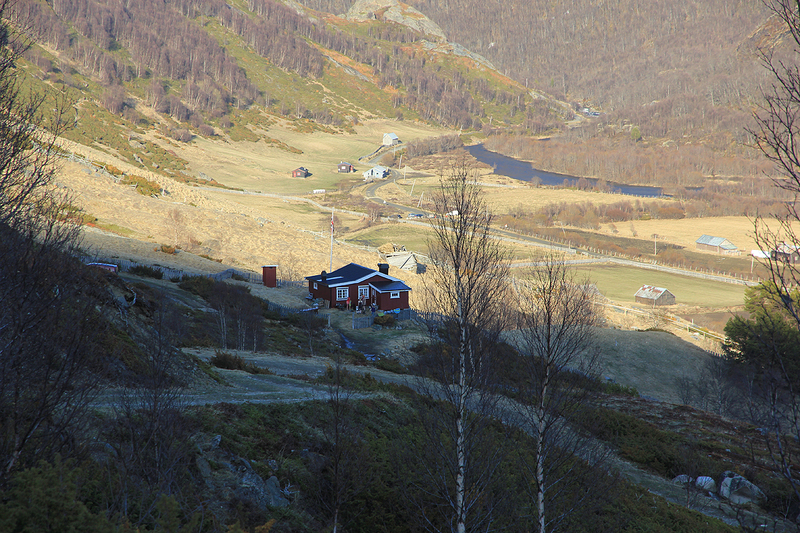 View while descending, Skardstinden, 2373 meter. View while descending, Loftet, 2170 meter.